Diamond is an Italian street artist known for his stencil works often depicting women. Born in 1977, in Rome, Diamond showed a talent for drawing during the early childhood. After attending art school, he earned MFA from the Fine Arts Academy in Rome. Diamond started off as a writer on the Roman scene in the early 90s, under the name Heroin (SHM). Some of his first pieces still can be seen in places such as the Forte Prenestino and some quarters as Trastevere, in the heart of Italy’s capital. In 1998, he had some legal problems caused by his illegal passion, so he was encouraged to change the way of his practice and move to more figurative artistic style. In 2002, he became a member of TTS crew and helped kick off an era of poster and stencil art in Rome. The stencil is just one of the techniques Diamond has been using in his practice to express all the emotions of life, from the strongest to the most basic. During the years, Diamond’s experience in the world of graffiti evolves. 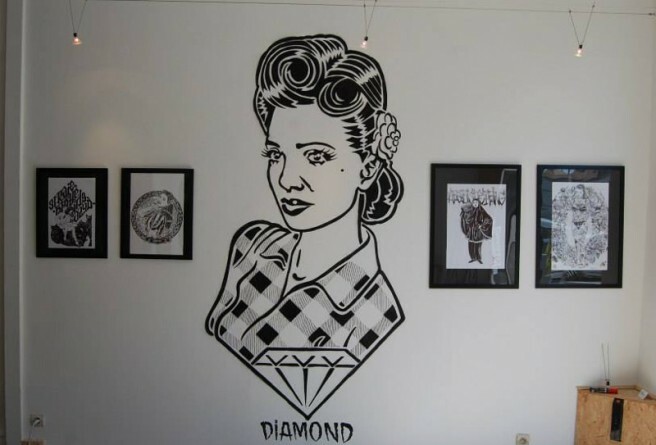 Without following the cliche of the classic street-art, the techniques Diamond uses are unusual and different, while his pieces are mainly in black and white. Using techniques ranging from acrylic to spray paint, Diamond turns his art into a sort of post-modern Art Nouveau capable of transforming the commonplace into highly valued objects. The artist goes in search of everyday objects which he then transforms into specific instruments removing the boundary between art and functionality. Windows, doors, screens and similar objects destined for the rubbish dump, become works of art, but without losing their earlier functionality. In 2012 Diamond participated in a live painting on the walls of Casa dell’Alta Economia in Rome. 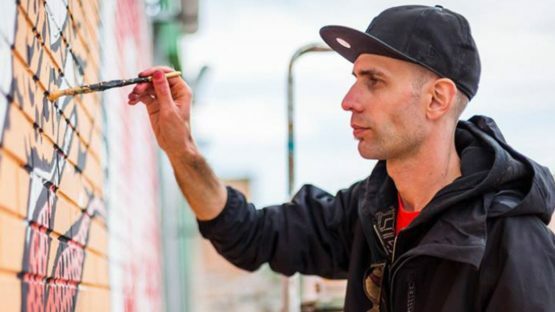 His work soon gain recognition not only by the Italian public but also from the international scene, thanks to the participation in numerous art fairs and street art festivals. Some of them include Upfest in Bristol, 2012, Stroke Art Fair in Monaco in 2011 and 2013 and Step in the Arena Festival in Eindhoven, 2011. In 2013 Diamond painted inside the MAAM – Museum of Other and Elsewhere (Museo dell’Altro e dell’Altrove). An atipical museum of contemporary art, the place is an housing occupancy of an old and abandoned ex factory of sausages. Thanks to curatorial interventions of Giorgio de Finis, the area became a factory of art. It contains many murals of artists such as Alice Pasquini, Borondo, Eduardo Kobra and others. In 2014 Diamond realized three paintings about mythological stories outside the Underground Station “San Paolo” in Rome. The project was organized by the association 999Contemporary and it was curated by Livia Fabiani. The concept is the representation of Le Metamorfosi (Metamorphosis) by Ovidio, a Roman poet who lived during 1st century BC. Diamond focused on two myths Tiresia and Aracne. 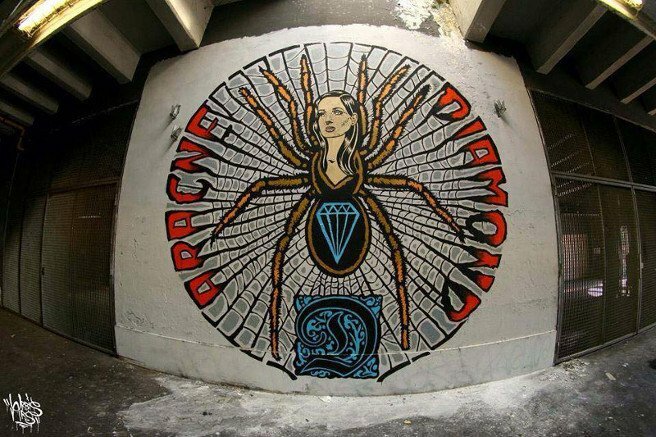 In 2015 Diamond painted on a wall tall 14 metres in Tor Marancia neighbourhood, one of the outskirts in Rome. The project, called Big City Life, was also organized by 999Contemporary. Diamond has participated in many solo and group shows in notable institutions including the MACRO and MACRO Pelanda (Museum of Contemporary Art in Rome), and at the home of Architecture in Rome, former Roman Aquarium, where he made a job site specific celebrating the oriental culture enlivening the streets of the Esquilino district. For the Diamond Werkstaette solo exhibition at White Noise Gallery, the artist will present the series of new works which seem to have been created for show in the modern incarnation of the Secession Building in Vienna. This Viennese monument has inspired Diamond’s installation in gallery’s project room, where the artist will show his personal version of Gustav Klimt’s painting Beethoven’s Frieze. The Diamond Werkstaette show will be on view from June 20th until July 31st, 2015, at White Noise Gallery in Rome, Italy. Diamond lives and works in Italy.